A matrix outlining the most likely and most impactful risks facing the world in 2017. The World Economic Forum surveyed 750 experts on what the most likely and impactful risks facing humanity are in 2017. In a report released Thursday, they ranked extreme weather as the most likely risk and the second-most impactful, trailing only the use of weapons of mass destruction. Climate change is responsible for driving an increase in the likelihood and intensity of extreme weather events, notably heat waves. Failing to adapt to or mitigate climate change and a host of other climate-connected risks including water and food crises and involuntary migration also rank in the top 10. To be sure, the machines, rise of illiberalism, income inequality and a raft of other problems all could disrupt the global order, according to the report. But climate change is growing in prominence as humanity’s biggest threat. It’s been a fixture in the top 5 threats in terms of likelihood and impact since 2011. Extreme weather tops the likelihood list a year after floods ravaged Louisiana and Hurricane Matthew inflicted $10 billion in damage. There were 15 disasters that cost the U.S. $1 billion or more in 2016, trailing only 2011 for a record number of billion-dollar disasters. 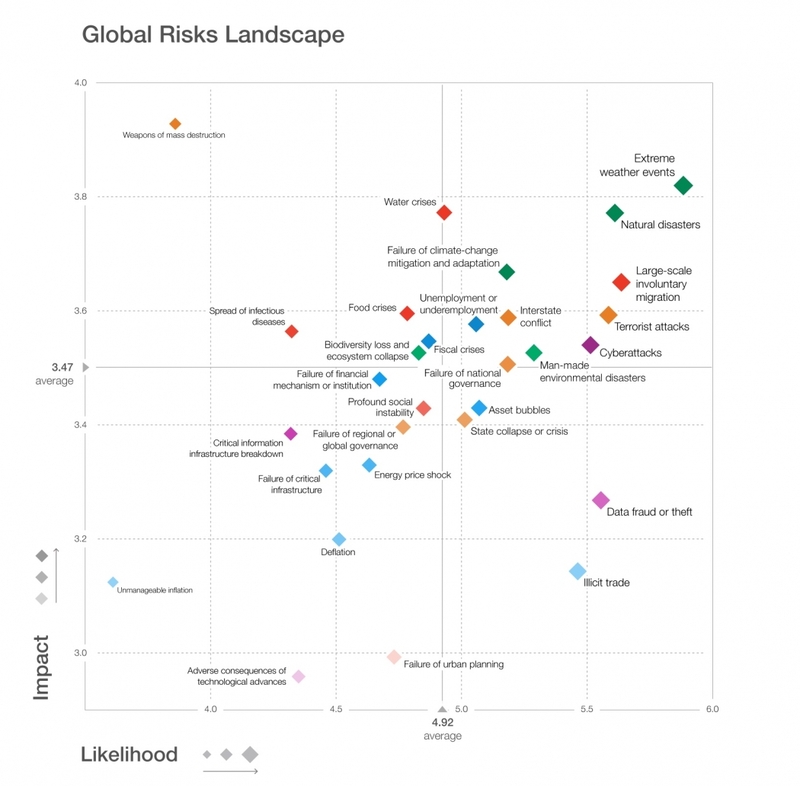 Climate change and its related impacts has been a fixture on the most likely global risks list since 2011. The impacts of climate change are becoming clearer with each passing day as we continue to pour carbon pollution into our atmosphere at an unprecedented pace. Among numerous impacts, the world just had its hottest year on record, Arctic sea ice is in sharp decline, and sea levels are rising and threatening coastal cities. Scientists have warned about knock-on effects ranging from increased risk of drought and conflict, changes to animal migration patterns and in the case of extreme weather, the potential for widescale human suffering after a storm passes. For all the concerns about the threat that climate change poses, there’s also a clear-cut path to reduce the risk. Cutting carbon pollution would help ensure that the worst impacts of climate change don’t come to pass and the World Economic Forum report makes a strong economic case for doing so rapidly. Climate change and its related impacts has also been among the most impactful risks to humanity since 2011. The report cites the freefall of solar panel costs, the rise of battery technologies and the record-setting pace of investment in renewables as signals that a new Industrial Revolution is already underway. Corporations such as Google are also plunging money into running on renewables, further underscoring the transition to a low-carbon economy. It’s a promising start, but investments will have to keep ramping up if the world is to meet its climate change goals outlined in the Paris Agreement. Otherwise, robots may end up owning the world after all.